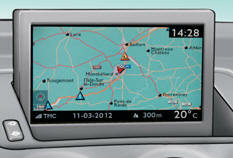 - menus for settings of the screen, navigation system and vehicle equipment. This menu allows you to choose a colour scheme for the screen, to adjust the brightness, set the date and time and choose the units for distance (km or miles), fuel consumption (l/100 km, mpg or km/l) and temperature (°Centigrade or °Fahrenheit). When setting the time, you can select " Synchronise minutes with GPS ", so that the minutes are set automatically by satellite reception. This men allows you to adjust the volume for navigation instructions and to choose the type of voice (male or female). This menu allows you to choose the language used by the screen (French, English, Italian, Portuguese, Spanish, German, Dutch, Turkish, Polish, Russian). ● Daytime running lamps function **. 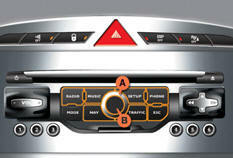 It lists the active alerts by displaying their associated messages in turn. ** According to country of sale.